There have been three identical looking projectors based on the same chassis in the ScreenPlay 7200 range, which have been launched with different iterations of the Texas Instruments (TI) 1280 x 720 XGA chipset. In the main, the exteriors didn't require redecoration. Although not as a small as some business projectors, the generic 7200 series is compact enough and easily handled, with a handle neatly moulded into the case. Yet the cooling system was always decently restrained, and although some light from inside leaks onto the outside world, none tended to point directly at the screen. The original projector in the series was the 7200, which used the Mustang DMD, with the then new 12° deflection mirrors offering a contrast ratio of 1400:1, and respectable 1,000 ANSI Lumens output. 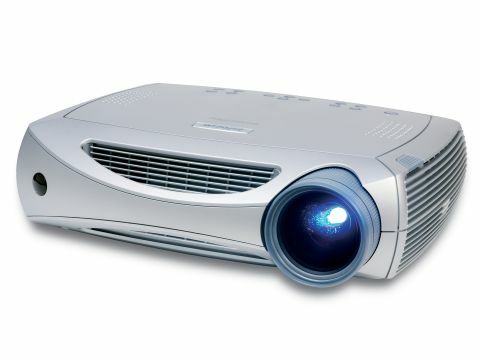 This was followed in short order by the 7205 which was essentially the same projector, but internally upgraded to the HD2 DMD, upping contrast ratio to 2,200:1 with a 7-segment colour wheel instead of the previous generation 6-segment wheel. A newly designed Zeiss lens was included with this model, and the light output increased by 10 per cent to 1,100 ANSI Lumens, an impressive figure for a fully optimised home cinema DLP projector. The 7210, reviewed here, effectively joins the 7205 at the top of the singlechip ScreenPlay tree. Slotting in above its range mate, it represents a further evolution of the core technology. This time, it uses the latest DarkChip3 DMD which leaves less space between adjacent mirrors and has a dark background that delivers further improvements in black level and contrast ratio, now up to 2,800:1. This is achieved in conjunction with a new variable speed, 7-segment colour wheel that incorporates a neutral density green segment. As usual the projector comes out of the box calibrated to D65 colour standards, and should need little adjustment. It incorporates the Faroudja 2310 DCDi video processor with 2:2 and 2:3 pulldown. There is also a Screenplay designed enhancement in the form of a new 48kHz film mode (NTSC analogue only) for DVD films originally shot at 48 frames per second. In other respects, the designers haven't mucked around with a familiar and successful story. The onscreen menu system is beginning to look a little dowdy against some more recent models, like an old version of Microsoft Windows, but the range of adjustments is strong, and the menu logic understandable. The range of eight inputs has not changed either: there is a strong array of digital and analogue options, including two S-video channels. HDMI and DVI-HDCP compatibility is achieved using the Infocus favoured M1-DA connector, which auto detects digital and analogue inputs and which will talk to HDCP encrypted HDMI and DVI as well as various analogue sources using the appropriate adaptor leads. There are problems with this approach, one being the extra cost of the adaptors or their leads, and another that some of the features, notably the autonegotiation of scaling options that takes place between two HDMI-enabled components, is not available. This is unlikely to have any noticeable effect in practice, except perhaps with some very oddball signal sources. The arrangement here operates much like a DVI input when connected to HDMI. There's not a lot to be said against this projector. We did notice a very occasional instability as the light wobbled momentarily, but this only happened a few times over several weeks and may be a sample fault, presumably of the UHP lamp itself. To its credit the now very refined optical system seems to be largely free of the colour flashes or occasional 'rainbow' effect that still mars lesser DLP projectors. As always, susceptibility to this varies widely, and ideally you should check first, but our guess is that this known DLP limitation is unlikely to be a problem for owners. The DC3 chip delivers an extremely fine picture. From a normal viewing distance (say two times screen width or more) it's difficult to see the individual pixels, so narrow is the border between the mirrors in this chipset. It is just possible to see the structure of picture with scrolling backgrounds, in action scenes, but not easily. The new Faroudja processor handles motion very smoothly and with only minor losses of fine detail, which meant a very impressive playthrough of the action scenes from The Matrix which looked very fluid, and if we can use such a word in this context, natural. The worst that can be said is that moving areas of the screen looked a little more grainy than stationary ones and there is some minor relaxation of picture detail. As already noted, the projector emerges from its cardboard sarcophagus supposedly set up. We found the image quality as received very slightly on the warm side of ideal - with a slightly 'butter bean' like quality with internally lit scenes. But this can be easily dialled out without detriment to basic picture quality. The blacks are quite intense, and a real improvement on the muddy grey common at this price point, and shadow detail is well handled. Skin tones (apart from a slightly jaundiced tint at the standard D65 settings, noticed for example in Chocolat, and again easily corrected) are natural and organic. Overall we found that performance standards rose to the occasion with well mastered films giving a visually expressive, walk-in quality in well darkened surroundings. Excellent. The Screenplay 7210 is yet another in what is rapidly becoming a wave of excellent Darkchip 3 DLP projectors. It's the cheapest of the DC3 models tested in this issue, and its performance and build represent real value. Overall, it edges ahead of the 7205 in the image stakes. The non-standard connectivity is something many could live with given the savings and its performance is highly credible.